SIM Upgrade Offer provided Free 1GB 4G with validity of 5 days from date of activation of offer. To avail the SIM Upgrade Offer, Customer should send “GO4G” SMS from his mobile to 12345 within 5 days of doing SIM Upgrade. Once the request for availing SIM Upgrade offer is received, the same will be processed within 48 hours. To consume the SIM Upgrade Offer, Customer should be upgraded to a 4G SIM & should have 4G compatible handset on Band 3 (1800 MHz). 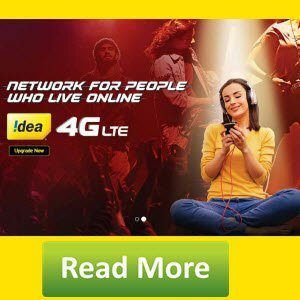 This offer can only be availed on Idea 4G network. SIM Upgrade offer is applicable only once to customer in his life time. Enter your Idea number and verify OTP. Fill up your details and Submit. Free Data will be activated in 48 hours.